Scott Derrickson's going to be very busy. The recently-named Doctor Strange director has been tapped for another project that's been a long time coming: MGM's Outer Limits. Derrickson's re-teaming with his Sinister co-writer C. Robert Cargill for the project, which sounds like a great fit. 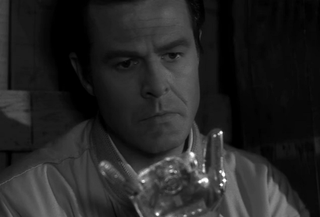 They're going to be adapting Harlan Ellison's 1964 Outer Limits episode, "Demon With a Glass Hand." The story followed a man who found himself sent into the past, with a limited memory, and a computer instead of a hand. He's also being hunted by aliens who have his missing hand. This could also be the shot in the arm the production needs, since MGM's been trying to get this thing made for four years. Image from the original "Demon With a Glass Hand"